Derbyshire have fought back after losing both openers on the opening morning of the Division Two match against Leicestershire at Derby. After the visitors decided to bowl first, Clint McKay and Charlie Shreck removed Billy Goldeman and Ben Slater in the first 13 overs but at lunch, Derbyshire had recovered to 78 for 2. 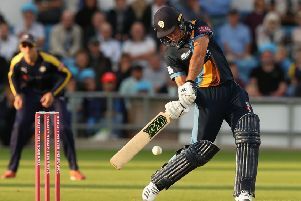 McKay found enough early movement to suggest bowling first was a good decision and he trapped Godleman lbw for nine in the seventh over with a ball that nipped back to catch the Derbyshire captain in front. He should have had Slater in his next over but Richard Jones spilled a straight-forward chance at point although the miss did not prove expensive. Slater added only 11 more runs before he completely mistimed a drive at Shreck’s first ball and chipped a simple catch to mid off with the total on 40. Wayne Madsen had bagged a pair in the previous game but got off the mark with a straight-driven four off Shreck as he and Alex Hughes batted carefully through the next 18 overs.